Author David Skuy and lead character Charlie Joyce are back, chasing hockey dreams but learning so much more about growing up and life in general. 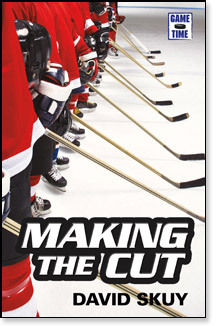 The new book is called Making the Cut. This is the third book in the Game Time series. The previous stories are Off the Crossbar and Rebel Power Play. The whole series is aimed at boys aged 10 and up who are amongst the most reluctant readers out there. No doubt they would rather be playing a sport or a video game, so anything that could lure these youths to the wonderful world of books is definitely welcome. For those familiar with the series, the book continues on nicely from previous stories. But by no means do you have to have read the first two books to pick up this title. It works as well as a stand-alone read as it does as part of the series. In this third book in the Game Time series featuring teenage hockey player Charlie Joyce, a summer hockey program promises to provide the opportunity of a lifetime. There will be NHL coaches, top trainers, and expert analysts, not to mention the chance to play with the best players in his age group, including his friends Scott and Nick…and his arch-rival Jake. Charlie is stoked. But things don’t go as planned. While Charlie makes Team 1, things are going wrong between him and the other guys, and even the coaches seem to be down on him. To make things worse, the NHL coach’s Stanley Cup ring goes missing. That is, until it shows up in Jake’s gear. Charlie is pretty sure Jake didn’t do it…and he’s pretty sure he knows who did. The Game Time series is a perfect selection for hockey lovers and for the reluctant boy reader. Fast-paced, authentic scenarios, coupled with the competitive spirit of high school hockey, create a truly compelling read. As always, Scholastic offers a free excerpt on their website. Remember, if you enjoy the book Making the Cut, be sure to check out the two other books in the series - Off the Crossbar and Rebel Power Play. I'm a girl too. I just got the book yesterday and I am halfway through it. I can't wait to get the other books! !